It's a little blurry, but this was my drive home from yoga this evening. First, I was thrilled that it was still light out at 5:15 p.m. when I set off from Keene. That in and of itself was enough to make me jump for joy. 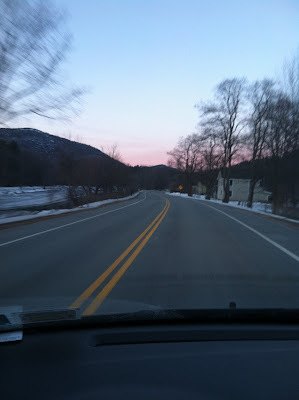 But then, as I drove towards Upper Jay and into Jay, I fell under the spell of the bright pink sunset. It was just all pink, over the mountains and the trees and the frozen river. A beautiful pink sunset. And I almost didn't want the ride to end. Why? Because that would mean going back home, back to the fight I had with Tom just before I left for class about keeping the house tidy... Back to all the things about myself that I've been confronting lately and trying to change. Back to the battles, the imperfections, the things about myself that bother me. Because, see, in yoga class, none of that matters. I can leave all of that behind and just focus on the moment. Robin reminds us - no judgements, no worries. We're just there, following our breath, and going deeper into our bodies, experiencing the sensations. It felt like a very short hour tonight. I could have gone on for another hour, honestly. When it was time for final shavasana, I almost wanted to cry. I wasn't ready to come back just yet.